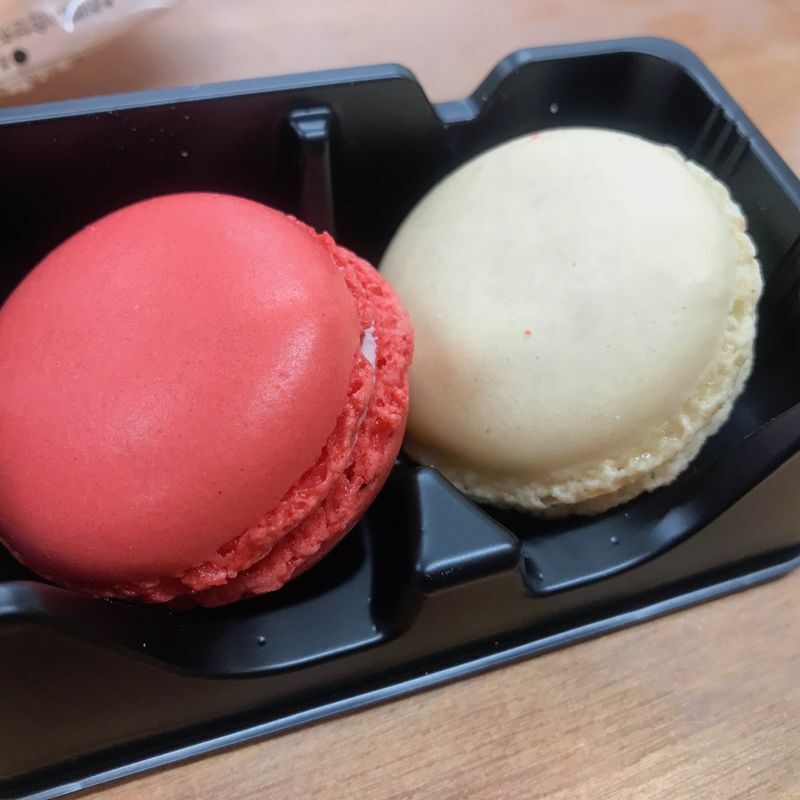 After visiting France two years ago, I became a huge fan of macarons. You can procure them pretty easily in the States, but Japan is a bit of a different story. Sure, they're not impossible to find, but the department stores and bakeries I check have high price tags. 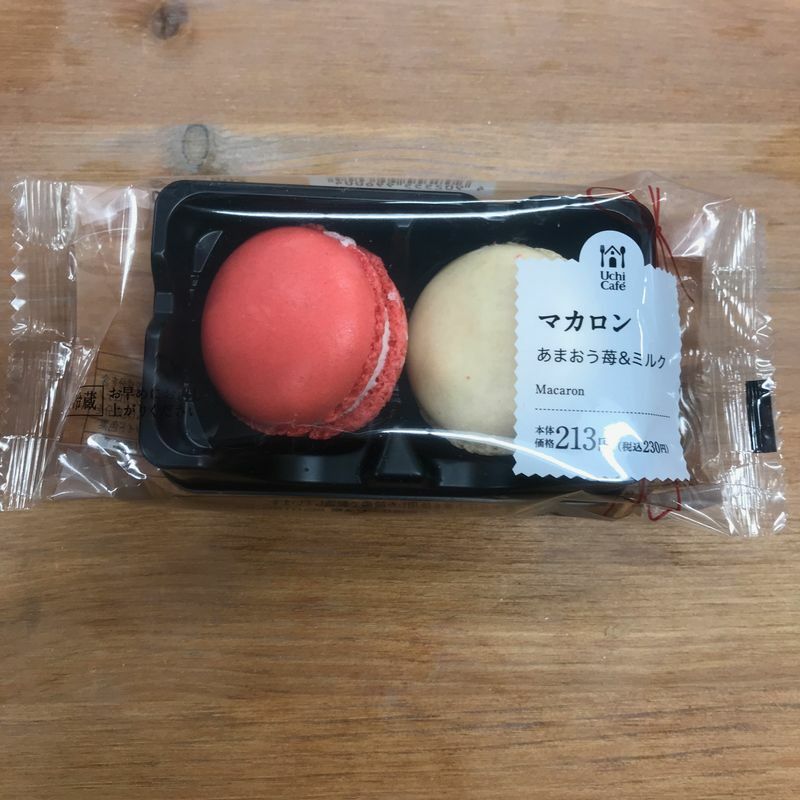 400 yen for a single macaron is out of my budget, unfortunately. 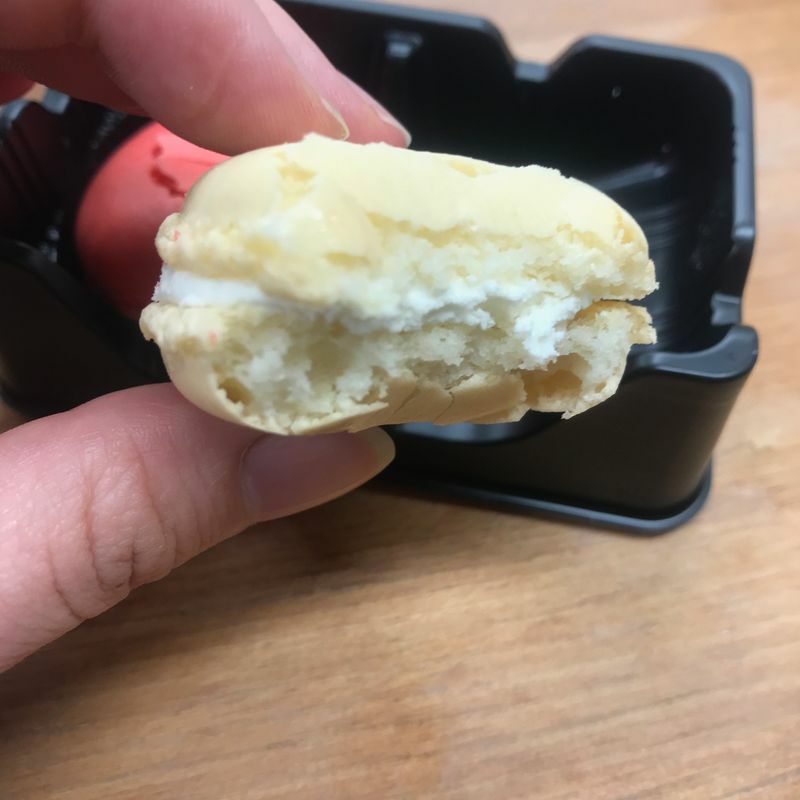 When I saw that convenience stores started offering macarons for sale, I was skeptical. How could a chain produce such a delicious French confection for such a low cost? The first time I saw the macarons was at a Family Mart. I bought them but was disappointed. They were cheaper than department store macarons, sure, but the flavor was lacking. My friend, who is a fellow macaron fan, recently turned me on to the Lawson brand of macarons. They only offer this package, with these two flavors, for only 230 yen after tax! 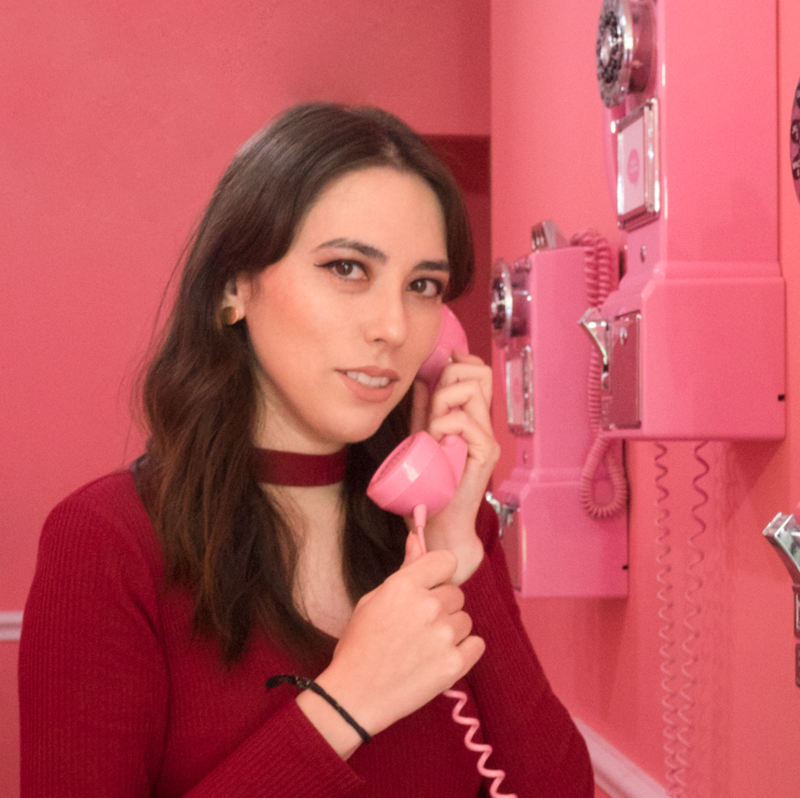 The two flavors are strawberry and milk. I was equally interested in both, but I'm a bigger fan of strawberry so I started with that one. This strawberry flavor is actually a specific strawberry. "Amaou strawberry" to be exact. It's actually a specialty strawberry strain from Fukuoka prefecture known for its beautiful shape as well as deliciously sweet flavor. 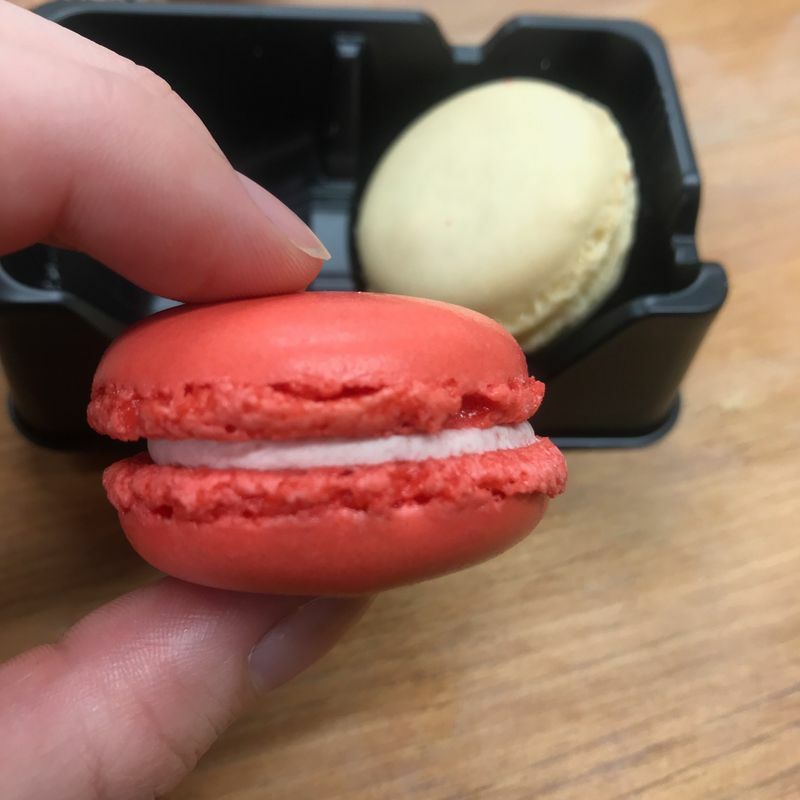 Even in macaron form, the strawberries lived up to their reputation. It didn't taste like an artificial strawberry flavor produced in a lab, but rather a natural flavoring, as though strawberry juice or something of the sort had been added. After taking a bite of the strawberry flavor, I tried the milk flavor immediately after for a comparison. Honestly, I wish that I had eaten the milk first because it didn't live up to the strawberry one. It was good, but it tasted like condensed milk. It was delicious, but rather generic in flavor. The texture of both of them was exquisite. They were fluffy with a tiny bit of a chew to them. The filling was nice and flavorful as well. None of it was too sweet or overbearing. For the price, the quality was phenomenal. I felt like I had found the sweets bargain of the century! So, if you ever have a craving for macarons, forget going to a high-end shop to get your fix. Skip over the other convenience stores on your way to the nearest Lawson and buy them up, courtesy of Uchi Cafe. However, be warned that they're often out of stock from what I've noticed. So if you see them, act fast!